We kept cycling along the western side of the Sri Nakarin (Sri Nakharind) Reservoir during the morning. At the largest village there was even a short stretch of asphalt. As we got closer to the lake shore and the ferry the road got smaller and rougher again. There is a small shop/restaurant at the "jetty" (gravel beach at the end of the road), and the ferry is supposed to leave at two p.m. or whenever it's full. The "ferry" looks like a barge with a longtail motor at the rear right corner. It has some shaded seating space along the sides and can probably take up to nine cars or other loads. We continue inland and west from here and the road climbs steeply into the forest complex. Some sections have concrete, but it's mostly loose or hard packed gravel. Steep climbs into the higher areas of the Western Forest Complex, Thailand. The road meets another road connecting to highway 323 later in the afternoon, and there is some asphalt road around a larger village. We see the first foreigner on the trip in this village, a dutch pensioner living there with his Thai wife. We camp a couple of kilometers north of it near a couple of steep limestone formations. 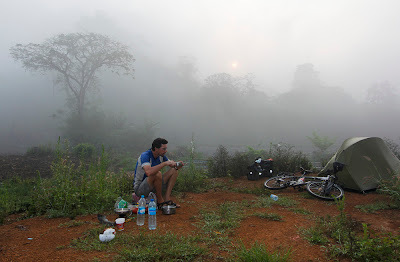 Morning mist and coffee at our second camp site. The Western Forest Complex (WFC) is a large wilderness, or near wilderness area in western Thailand. It's located between Kanchanaburi in the south and Umphang in the north. To the west it's bordering Myanmar (Burma), and to the east lies the central lowlands around Bangkok, Uthai Thani, Kampaeng Phet, etc. The area has World Heritage status and consists of seventeen protected forest areas like national parks and wildlife sanctuaries. There are some settlements, but few roads. No roads connect the southern part with the northern, and the northern part has no connection to the east, where the central lowlands lay. You have to enter from the south, the southeast or directly from the north via the spectacular Mea Sot - Umphang road. The challenge, or a major challenge among many others, is to cross this vast area from south to north (or the opposite direction) by bicycle. 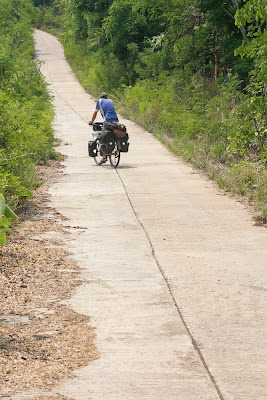 The trip has been done for the first time on motorbikes (late 2010), but that was with a local Karen guide and GPS. Me and my friend and touring cyclist Kevin decided to try on our own, with no guide and no GPS. The odds didn't seem too good, but we were optimistic and had some advantages. We had tents and can carry food for many days on our bikes. We have plenty of time. The bikers had a long weekend. 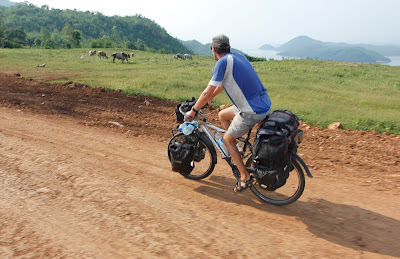 We started by cycling to Kanchanaburi. There we went to the TAT (Tourist Authority of Thailand). The ladies there gave us telephone numbers to park officials who may or may not give us any necessary permits. We went back to our veranda at the river Kwai and made the phone calls. A lady who spoke some english explained that we may get permission but she had to ask her boss first. I should call back in ten minutes. After 15 minutes I called back. A man explained that we could get permission to go as far as Laiwo, but not to Tilaipa, the last village with a road coming from the south along the Myanmar border. This is kind of understandable since the village is right on the border, and the area is sensitive due to refugees (and possibly drugs) coming in from Myanmar, but it is also the route the bikers used. They probably got a permit because of their guide. I asked about the more central areas casually, and Mr F told me that it would be no problem to go there, but we didn't get into any details. We decided to try the central route into the wilderness. 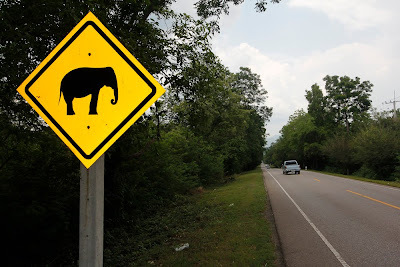 On the road to Erawan National Park, Thailand. April 2011. We left the next morning with food for a few days. We would still be able to find small shops and restaurants for a couple of days ahead. We cycled up to Erawan National Park and Erawan Waterfall, but didn't enter. Instead we continued on into WFC on steeper and steeper dirt roads. Soon we where high above the Nakharin Reservoir, a huge man made lake. There are a few small villages in this area, and some farming, but mostly forested mountains. Kevin high above the Nakharin Reservoir in the Western Forest Complex, Thailand. April 2011. We camped with great views of the lake, after a rice dinner in a roadside restaurant.